#VaragarisiVenthayaKanji #KodoMilletFenugreekPorridge : #Varagu or #varagarisi is known as #KodoMillet in English. #Millet are small seeded grasses and are rich sources of vitamins and minerals. Here let us see how to prepare a kanji ( porridge ) using kodo millet and venthayam ( fenugreek ). 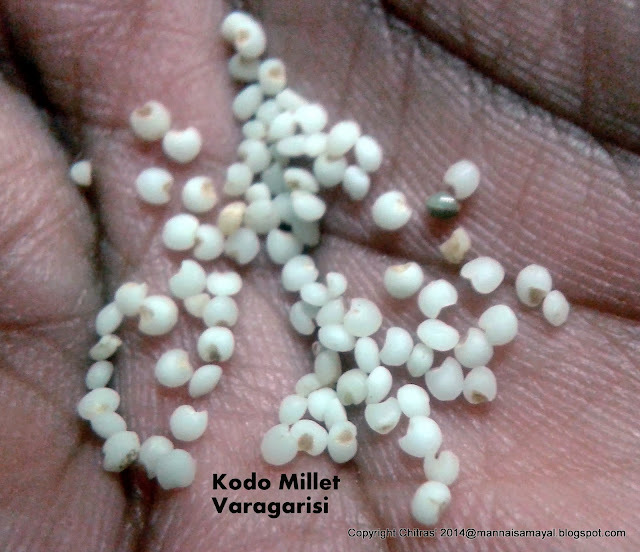 Dry roast varagarisi [ kodo millet ] until it turns bright white color. Now dry roast green gram dal and fenu greek until it turns to golden color. Transfer into the same vessel. Wash well and take in a cooker. Add 4 cups of water and add given ingredients except milk. Close lid with weight ON. Pressure cook for 3 whistles and 7 minutes on SIM. Open after the steam has completely subsided. Mix well with a ladle. Tasty kanji is ready. Serve hot in a bowl by adding milk. Enjoy with pickle or any thuvaiyal.